On July 8, 1995, the Hope Creek Generating Station in New Jersey was in cold shutdown, meaning that the reactor was at zero power with its water temperature less than 212°F. To keep the reactor water from boiling, the residual heat removal (RHR) system (on the right side of the figure) was being used to take water from one of the recirculation system’s pipes connected to the reactor vessel, put it through a heat exchanger to cool it down, and then return it to the same recirculation system pipe where it flowed back into the reactor vessel. 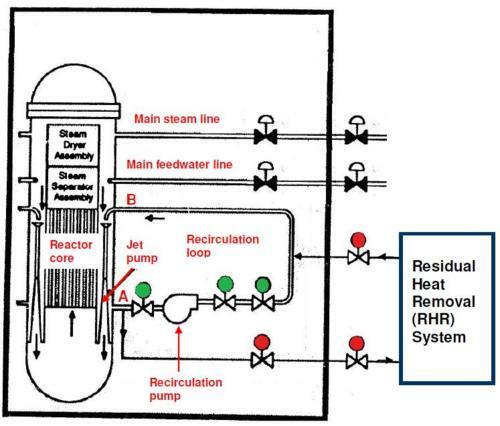 When the reactor is operating, two recirculation loops (like the one shown in the Figure) are in service. Each recirculation loop has a large motor-driven recirculation pump that draws water from the reactor vessel and returns it to the reactor vessel. This flow enters inverted nozzles called jet pumps. The high velocity water entering the jet pumps entrains other water, such as that being supplied to the reactor vessel via the main feedwater lines, and forces it to the lower domed region where it is turned upward to flow through and cool the reactor core. When the reactor is not operating and the RHR system is being used to cool the reactor core, three valves in each recirculation loop (identified with the green circles) are closed and three valves in the RHR shutdown cooling suction and return lines (identified with the red circles) are opened. The RHR system pump then pulls water from the recirculation pump’s suction piping (denoted in the figure by A) and returns it to the recirculation pump’s discharge piping (B), with the closed recirculation system valves forcing the cooled water to flow through the reactor core before returning to the recirculation pump’s suction piping. Unfortunately, the operators at Hope Creek chose to partially open the normally closed green valves in the recirculation loop piping. Procedures did not allow these valves to be open when the RHR system was cooling the reactor, but they did it anyway in an ill-advised attempt to limit the temperature differential between the water in the recirculation loop piping and the water in the reactor vessel. Rather than flowing to point B, about 40 percent of the cooler water being returned by the RHR system flowed through the partially opened green valves to point A where it got drawn out by the RHR system and was further cooled. With cooling water diverted from flowing through the reactor core, the water temperature inside the reactor vessel increased. The operators did not recognize this situation because they were monitoring a thermometer in the RHR system that reading about 160°F. The cool water passing through the opened green valves, essentially short-circuiting the reactor core, made the RHR system temperature much lower than the reactor water temperature. The reactor water temperature eventually reached boiling, a condition prohibited by the plant’s operating license for that configuration. The operators inadvertently created the situation they attempted to avoid, which was having a large temperature difference between water in the recirculation loop and that in the reactor vessel. Relatively cool water in the recirculation loop piping compared to the reactor vessel poses problems when the recirculation pump is restarted. The injection of cooler water into the reactor vessel puts stress on metal parts that contract when temperature drops and expand when temperature rises. In addition, the injection of cooler water adds positive reactivity and associated control challenges if the reactor is operating. With the three green valves closed, the water in the piping between the valves is isolated from the water in the reactor vessel. Seeking to prevent this isolation from causing a temperature difference between the two volumes of water, the operators partially opened the valves. By doing so, they created a condition where the recirculation loop piping between the two connections with the RHR system was about 50°F lower than the temperature of the water inside the reactor vessel. The operators had good intentions when they violated procedures to open the recirculation loop valves. But their good intentions caused the condition they wanted to avoid. The bypass pathway they created allowed the recirculation loop temperature to drop nearly 50°F below the reactor vessel water temperature. Had the operating procedure been revised to permit the recirculation loop valves to be partially opened, provisions likely would have been included to monitor both the reactor vessel water temperature and the RHR system temperature. Because the intent behind partially opening the valves was to limit the temperature difference between these two water volumes, monitoring both temperatures is the proper means to determine if that objective is being met. Procedures may not always be right, but intentionally violating procedures is always wrong.